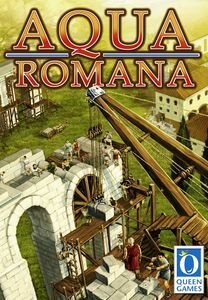 The young, up-and-coming Roman kingdom needs a wide variety of things, but the one thing the big towns need above all others is drinking water. So experienced master builders and diligent workmen set about building mighty aquaducts to provide the people with water. Use your skill to make sure that your workmen have access to the necessary master builders at all times and are able to build the longest water system. However, all your achievements will receive less attention if the other players manage to transport the same amount of water to the town.